Our home is on a corner lot. In many ways, I love it. We only have a neighbor on one side, we have easy access to the rest of the neighborhood from our backyard. In the “time before kids” I didn’t think we needed a fence – I liked the idea of (eventually) letting the kids run through the yards up the street to play with friends. I didn’t mind seeing everyone come and go down the street. But now, with two little guys that love spending time in the backyard, I’m getting tired of waving to everyone as they drive up the street, or walk their dog, or jog by. I’d just like to sit on my back porch without monitoring the neighborhood. My husband and I have toyed with the idea of a fence, but it seems like going a bit too far. We don’t want to totally shut ourselves off, just create a little barrier between us and the street. We’ve decided the best way for us to create some privacy is through plants. And, because we like to be difficult, we don’t want boxwoods or laurels or traditional evergreens. 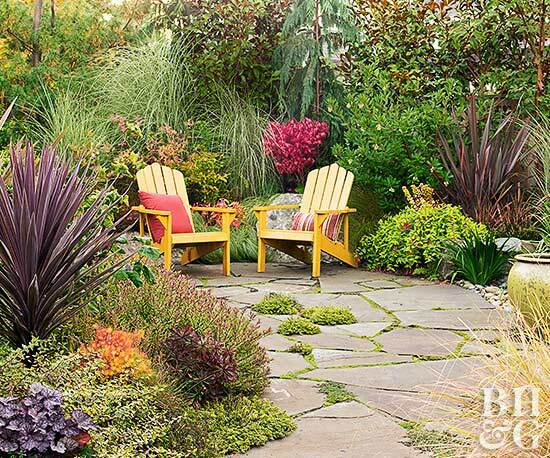 We want “pretty” greenery, preferably that stays green all year. Tall order, I know. I’ve been looking for inspiration on Pinterest. I realize a lot of this dies back in winter -but I like the layers of the plants. 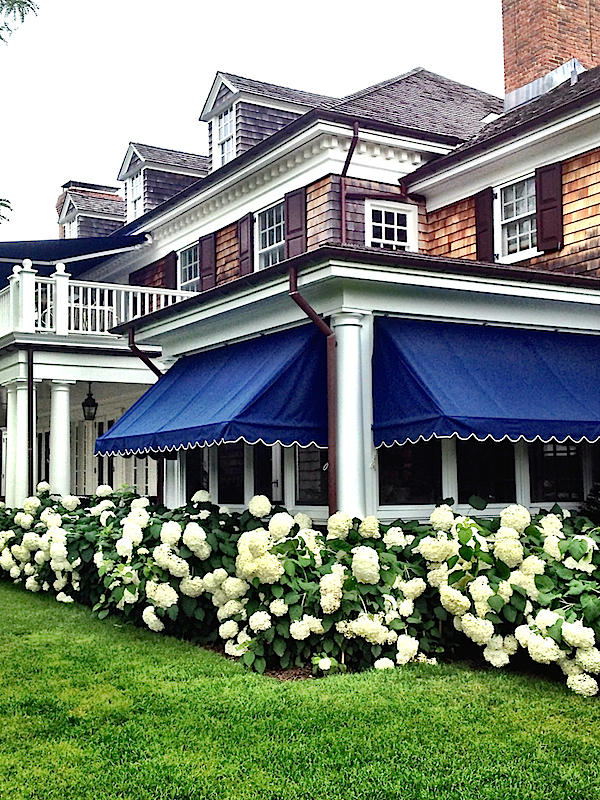 We already have our porch surrounded by hydrangeas, but I’d love to have more along the border of the yard. Again, another plant that won’t offer privacy in winter! 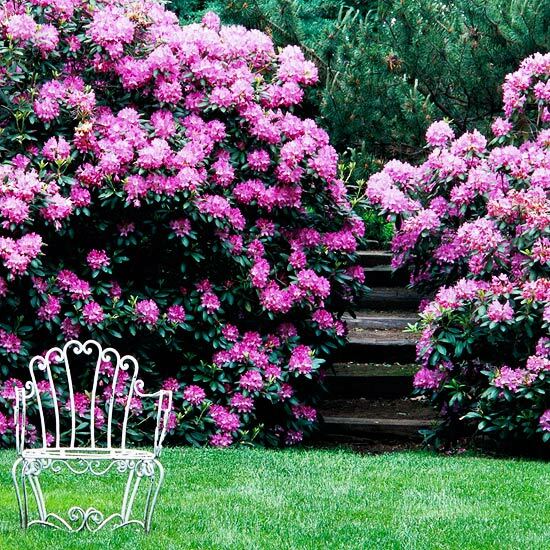 Rhododendrons will stay green all year, and produce beautiful flowers in spring. Right now, this is my favorite option for our yard. 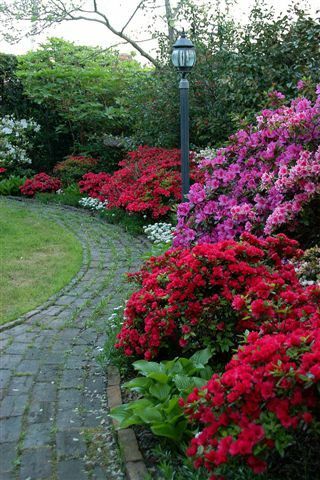 Azaleas could be another option. I’m hoping we can do some fall planting to get things started, and add to it in spring. Have you planted for privacy at your home? Any advice or suggestions on plants? We need to talk, Kristen! We’re changing our landscaping this fall and I’m having such a hard time coming up with a plan (I know you’re shocked!). One thing to consider is that in winter you probably won’t be out playing in the yard as much so it may not matter if the plants don’t provide as much privacy. You just need to decide if it matters to you aesthetically if they are not green. Some plants we looked at are nandinas and euonymus. They don’t flower, but apparently both are evergreens. How about viburnum? I think some varieties are non-deciduous and they apparently have yummy smelling flowers in spring (although not all flower, so you need to check that). Good luck deciding!! We have palm trees! Big giant fan palms. Most likely will not work for you. I have had rhodendroms in the past. Nothing quite as lovely as those bright colors in the spring! I do have azaleas here in Florida, only of the dwarf variety. I love those blooms, as well. And the pretty glossy leaves are so nice all year round. Cannot wait to see what you choose. I love your ideas Kristen. Have you considered boxwood hedges, they can get fairly high and look great year round!